Last week it was my turn to bring snacks for the preschool class. Believe it or not, I actually like coming up with new ideas and having an excuse to bake (although DH shakes his head when he finds me sliding pans out of the oven at midnight). My snacks aren’t very cute or visually creative, but they are healthy and tasty, I hope. This is a recipe my Mom invented, and it is a favorite with all of her grandchildren. It’s great for kids with allergies, and sweet without any sugar. It can easily be made gluten-free or dairy-free. Blend papaya and water with oil, vanilla, applesauce, honey, egg (or egg replacer). Remove wet ingredients from food processor. Next blend in food processor the dry ingredients: oats, salt, cinnamon, baking powder. Add 1 cup whole wheat flour to above mixture. Mix well, then add Rice Krispies. Drop by small scoop onto parchment-lined baking sheets. One of my favorite family-friendly cookbooks is Gwyneth Paltrow’s My Father’s Daughter. She cooks with her kids in mind, and I have been surprised more than once when I have skeptically tried one of her recipes, and found that my kids gobbled it up. She has a lot of easy recipes, with just a short list of ingredients. This is the one I have made more than any other, and it consistently pleases the whole family — one of very few dishes! Here is my (adapted slightly) version. Chop the kale very very finely. This is the secret to making the dish kid-friendly. Use a large, sharp chef’s knife and try to chop like you see chefs chop on TV! 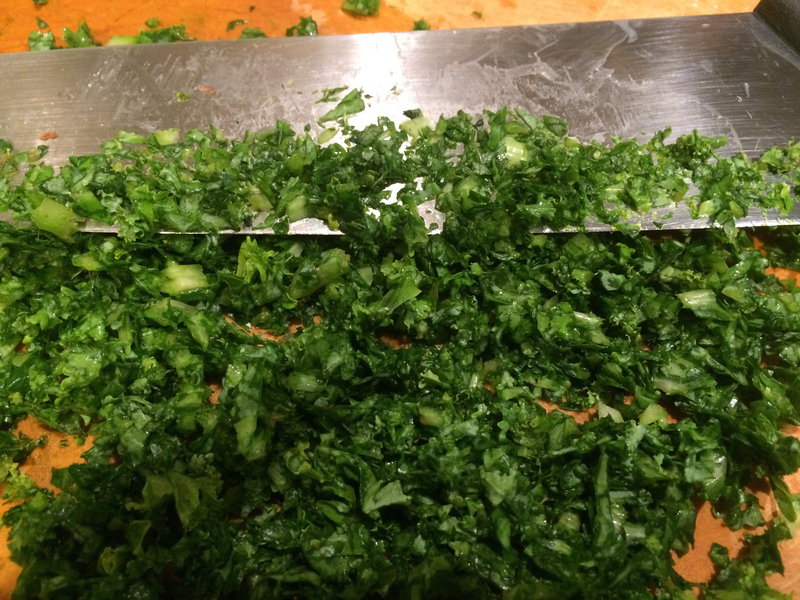 You want the green pieces to be as small as you can chop them, like the way you might chop parsley. It takes a while, but eventually you’ll have a pile of fine green kale. Heat the vegetable oil in a large cast iron or nonstick skillet. Add the garlic and cook for a minute or two on medium-low heat. Add the kale and green onions and cook for a few more minutes until the kale has wilted and reduced. Add the rice and stir to mix thoroughly, cooking for another two minutes. Finally add the soy sauce. Serve hot. I often serve Green Rice with roasted sweet potatoes. My friend Natalya has a great recipe on her blog here. This recipe is my standby. In my humble opinion, homemade tomato sauce tastes worlds better than any you buy in a jar. I fill this sauce with vegetables and the kids eat it in large quantities (as long as it tops some kind of carb!). I make a big pot on a day when I am going to be home all afternoon and freeze portions in the freezer so that I can make a quick spaghetti or pizza dinner when we are late getting back from swimming lessons and the kids are starving. I use a cast iron Dutch oven, because it cooks really well for a long time at a low temperature, but you can use any big pot. Begin by adding the onions to the olive oil. Start at a medium temperature, and when you start hearing sizzling, turn the temperature to low. Put the lid on and cook for about 10 minutes, stirring occasionally. Add carrots, sweet potato, red peppers, zucchini and cook until softened (about 15 minutes), stirring occasionally. Add diced tomatoes and other remaining ingredients. Continue to cook on low, with the lid on, for about three or four hours, or until the sauce is no longer watery, but thick. Serve liberally on whole wheat spaghetti or use as a pizza sauce. This red sauce also works well on spaghetti squash or zucchini — although I can’t my kids to eat them! But often when I am making them spaghetti, I will roast a spaghetti squash, take out the strands with a fork and replace my pasta with the squash. Or instead of eating pizza, I will make zucchini pizza by spreading the red sauce on zucchini halves with a few extra pieces of garlic on top and roasting them in the oven for about 20 minutes. Delicious! If only I could convince my kids. . . But at least I know they are getting some vegetables with this hearty sauce!